From time to time there are people, places, things and references found in Lovecraft’s writing that aren’t used in our every day vocabulary. To be honest some of these words weren’t even used in Lovecraft’s day and age. In this section I will try my best to give definitions or information about some of the words that Lovecraft uses in his writing. I will also try to track down information on people, places or things he mentions in his stories. This will be a work in progress as our group continues to read the works of H.P. Lovecraft. If you happen to find a word that you think belongs in this dictionary feel free to let me know and I will add it here. Angarola – Anthony Angarola, 1893-1929 was an American painter and art instructor. He graduated from the School of the Art Institute of Chicago. Since he was an Italian immigrant himself, his work focused on people who struggled to adapt to a foreign culture. Angarola is also notable as one of the favorite artists of H.P. Lovecraft. 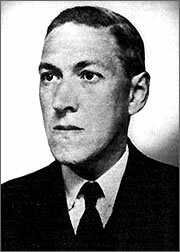 Lovecraft makes a reference to the works of Angarola in both The Call of Cthulhu and Pickman’s Model. It is also ironic that Lovecraft would be such a huge fan of Angarola given that he is an immigrant. Antediluvian – The antediluvian (or pre-diluvian) period – meaning “before the deluge” – is the period referred to in the Bible between the Creation of the Earth and the Deluge (flood). The story takes up chapters 1-6 (excluding the flood narrative) of Genesis. In popular culture, the term is used to refer to any ancient and murky period. Cotton Mather – February 12, 1663 – February 13, 1728. 1678, Mather was a socially and politically influential New England Puritan minister, prolific author and pamphleteer; he is often remembered for his role in the Salem witch trials. Cyclopean – Cyclopean masonry is a type of stonework found in Mycenaean architecture, built with huge limestone boulders, roughly fitted together with minimal clearance between adjacent stones and no use of mortar. The boulders are typically unworked, but are sometimes roughly worked with a hammer, and the gaps between boulders are often filled in with smaller hunks of limestone. The most famous examples of Cyclopean masonry are found in the walls of Mycenae and Tiryns, and the style is characteristic of Mycenaean fortifications. Similar styles of stonework are found in other cultures. The term comes from the classical Greeks’ belief that only the mythical Cyclopes had the strength to move the enormous boulders that made up the walls of Mycenae and Tiryns. Pliny’s Natural History reported the tradition attributed to Aristotle, that the Cyclopes were the inventors of masonry towers, giving rise to the designation Cyclopean. Cymric – noun; Cymric or Kymric, the Celtic language of Wales. Doré (Pickman’s Model) – Paul Gustave Doré, January 6, 1832 –; January 23, 1883) was a French artist, engraver, illustrator and sculptor. Doré worked primarily with wood engraving and steel engraving. Eldritch – adjective; From Middle English eldrich, from earlier elrich, equivalent to Old English el- (“foreign, strange, uncanny”); hence “of a strange country, pertaining to the Otherworld”; compare Old English ellende “in a foreign land, exiled” (compare German Elend “penury, distress” and Dutch ellende “misery”), Runic Norse alja-markir“foreigner”. Fuseli (Pickman’s Model) – John Henry Fuseli, February 7, 1741 – April 17, 1825 was a British painter, draughtsman and writer on art, of German-Swiss origin. Most famous for his work The Nightmare. Grotto – A grotto (Italian grotta) is any type of natural or artificial cave that is associated with modern, historic or prehistoric use by humans. When it is not an artificial garden feature, a grotto is often a small cave near water and often flooded or liable to flood at high tide. Hadoth – Sealed valley by the Nile amidst the hills of Neb, possibly just east of the Pharaoh Akhematen’s city of Tel el – Amarna. This vale holds the catacombs of Nephren-Ka. Hadoth is yet another creation of Lovecraft’s used by other writers after Lovecraft’s death. It is only mentioned by Lovecraft in the story “The Outsider”. Neb – Thought to be derived from the temple of Neb-hepet-Re Mentuhotep. It could be that Lovecraft just made this up. It is not mentioned in any of his other works. Anyone with information on this please feel free to comment. Nephren-Ka – Also known as the Black Pharaoh. Mythical ruler of ancient Egypt. Mentioned in several other Lovecraft stories. Nephren-Ka is one of Lovecraft’s creations. Priory – A priory is a house of men or women under religious vows headed by a prior or prioress. Priories may be houses of mendicant friars or religious sisters (as the Dominicans, Augustinians and Carmelites, for instance), or monasteries of monks or nuns (as the Carthusians). Sime (Pickman’s Model) – Sidney Sime, 1867 – May 22, 1941 was an English artist in the late Victorian and succeeding periods, mostly remembered for his fantastic and satirical artwork, especially his story illustrations for Irish author Lord Dunsany. Given Lovecraft’s love of the works of Lord Dunsany it is little wonder that Sime is mentioned as a “great artist”. Regnum Congo (The Picture in the House) – Wrote by Antonio Pigafetta (1491 – 1534) who was an Italian scholar and traveller from the Republic of Venice. He traveled with the Portuguese explorer Ferdinand Megellan and his crew on their voyage to the Indies. Regnum Congo is a real book however much of what Lovecraft writes about in this story is incorrect as he had never seen the real book. He learned about it in Thomas Henry Huxley’s Man’s Place in Nature and Other Anthropological Essays.